How to get there: Trollheimen may be accessed from several convenient trailheads. I decided to start from the north, the kommune center of Rindal being the closest area with services. Rindal is about 100 kilometer from Trondheim, travel from Trondheim to Orkanger (2 toll crossings, 16 NOK each, exact change! ), then take Hwy. 65 to Rindal. In Rindal, there is a nice rustic hotel called Saga. To find it, take the second exit to Rindal (in a place called Bolme), then drive about one kilometer and look for a (small) sign on a left hand side driveway. In order to find the trailhead, measure from the gas station in Rindal located on Hwy 65. 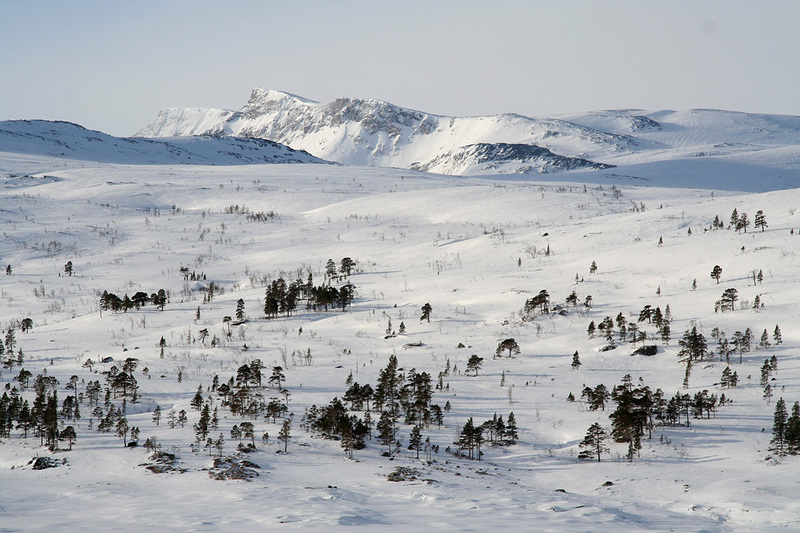 Travel 8 kilometer (west) and locate a road that goes left with a sign saying Folldalen. Take this road, after about 600 meter (beyond a farm), you will find a self serve toll station. A single trip costs NOK 50 (in 2007). Continue up the hill, the road then follows the east side of lake Follsjøen. 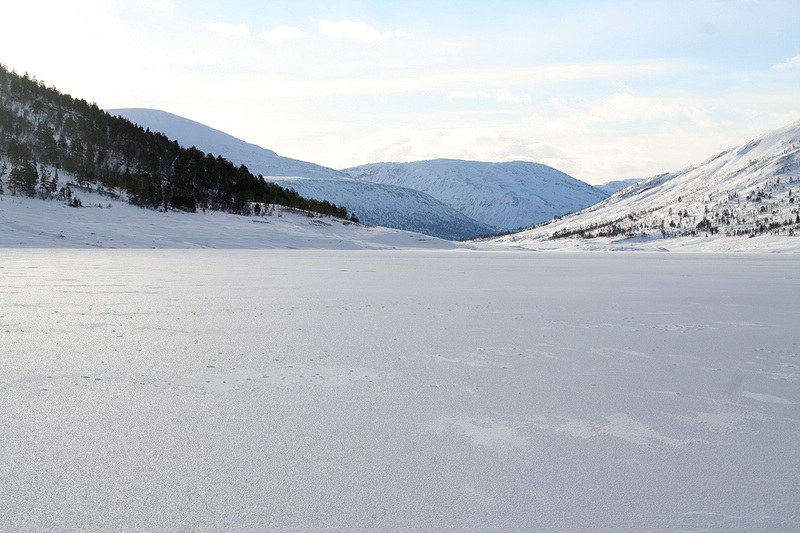 Finally, the road heads downhill to the base of the huge dam that contains the next lake, Gråsjøen. In winter, the road ends here. In summer, the road may continue a few more kilometer. There is a small parking area. This is the trailhead, location N62:56.033, E009:07.575, elevation 430 meter. Route description: The standard summer route traverses the mountain, the trail runs directly up from the tourist hut Trollheimshytta. In winter, this mountain is somewhat more of a challenge. I had heard, but not in any reliable way that the summer route was unsuitable as a winter ski route. The route described below is likely to work as a good winter route. From the trailhead described above, follow the road up to the lake. 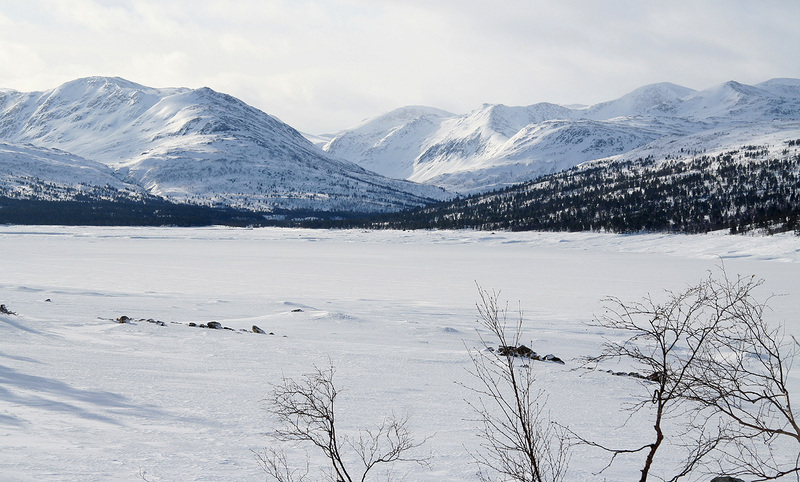 If the ice on the Gråsjøen lake is OK (most likely in normal winters), then descend to the lake across broken ice (since the lake is normally lower as the winter progresses) and ski along towards the south-east. Gradually, the slope on your left becomes more gentle, leave the lake (approximately at N62:53.788, E009:12.483) and start a gradual climb. Contour below Kongensgrøfjellet (932m) and cross the creek Kvernabekken just west of the Kvernabekkvatnet lake. Continue a very gradual traversing climb in order to reach the north ridge of North Trollhetta at elevation about 1000 meter. This ridge looks pretty steep, but is not all that bad. Consider possible avalanche conditions. 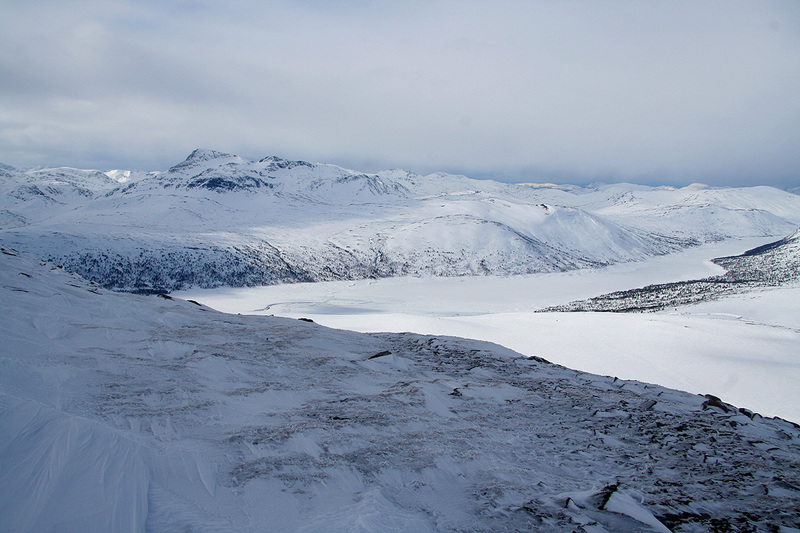 Most likely, this ridge is dotted with rocks and only a fairly thin snow cover, thus safe to climb. Zig-zag directly up, the steeper part is only about 100 vertical meter. 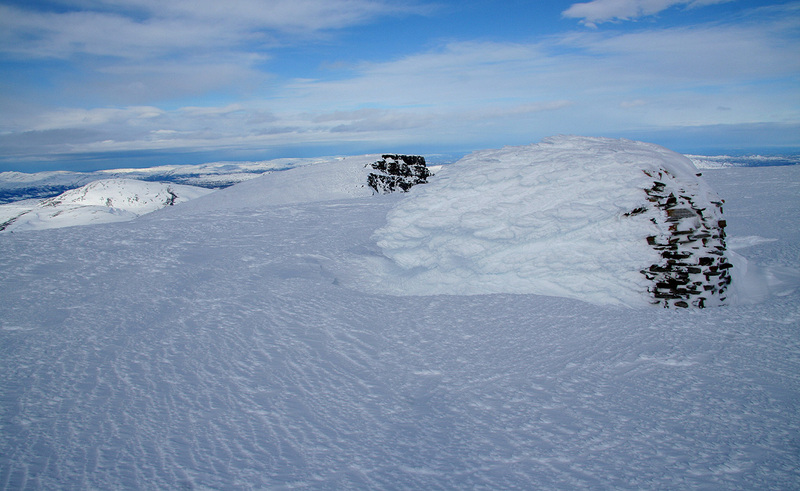 As soon as the slope is more gentle, one can contour around the north summit on the west side and reach the broad saddle between the two summits. The final snow slope is easier if you go far left (east), then follow the fairly gentle slope before reaching the large and very flat summit area. Comments/Trip Report: I had planned this three day skitrip for some time. I had never been to Trollheimen before, so this was high time. My somewhat ambitious (but realistic) plan was to climb the three highest and also most prominent mountains in three days. The plan called for spending two nights at the self serve hut Trollheimshytta, climbing Trollhetta along the way to the hut, then do Blåhøa on Saturday and finally ski back out via the Snota mountain on Sunday. I flew to Trondheim, late Thursday, picked up a rental car and drove to Rindal. I arrived around 1030 and was warmly welcomed by the Saga hotel, serving dinner and a cold beer. The next day I had a hearty breakfast and then drove to the trailhead, starting out shortly after 0830. The weather was a bit windy, but partly clouded, with plenty of sunshine. I immediately sensed the wilderness ahead, scattered trees and good sized mountains. I skied along the lake on a near perfect surface, the wind came from behind and in less than one hour it was time to leave the lake and start the gradual climb. Trollhetta with her two summits was straight ahead. I made a brief stop, my skies needed new wax after running on the icy crust of the lake. I could already feel that this promised to be a great trip, not a ski track anywhere, just me paying a visit to quite a large scale mountain wilderness. Soon, I could see towards the end of the lake, somewhere beyond was the hut that I planned to use for the next two nights. Skiing was a bit heavier, I sunk about 10-15 centimeter into the snow as I made my way uphill between the trees. The trees are nicely scattered, no dense forest, always easy to find a good track. There were several creeks coming down the slope, mostly open water, but with enough snow bridges to make crossings easy. 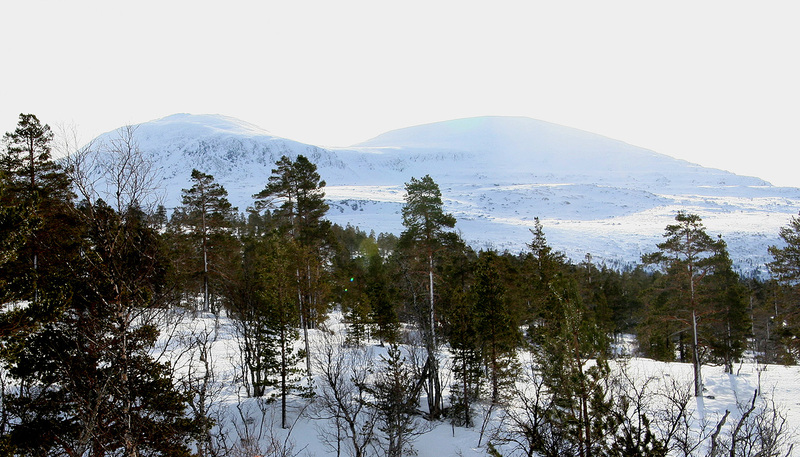 As I came above the trees, a nice panorama unfolded from Trollhetta and around the end of the lake to Snota on the opposite side. Trollhetta was ahead, but the mountain that caught my imagination was behind and across. Snota, truly the local queen ruling this wilderness. I soon reached the lower part of the north ridge. 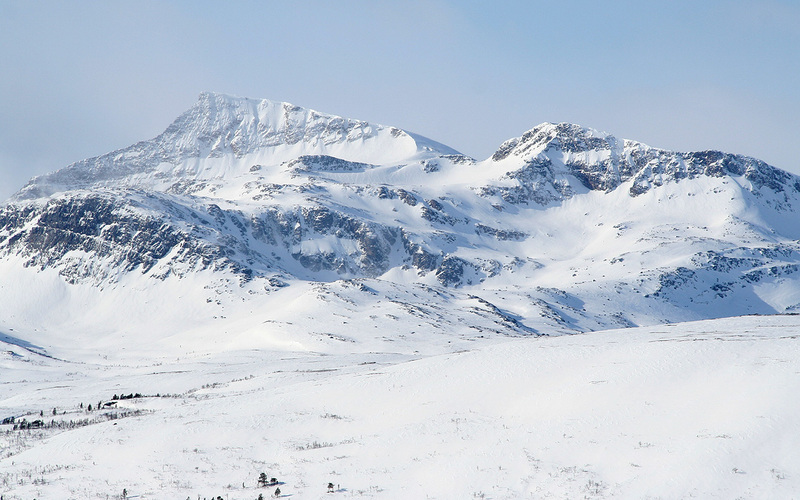 The avalanche danger had been forecasted as high, thus the snow accumulation would be an important factor when judging the rest of the route. Just as I had hoped, the slope was dotted with rocks and did not pose any danger. However, I had for some time been traversing a fairly icy crust with limited grip for my skis. It had taken me slightly less than 3.5 hours to get here. The slope above looked significantly steeper than anticipated. 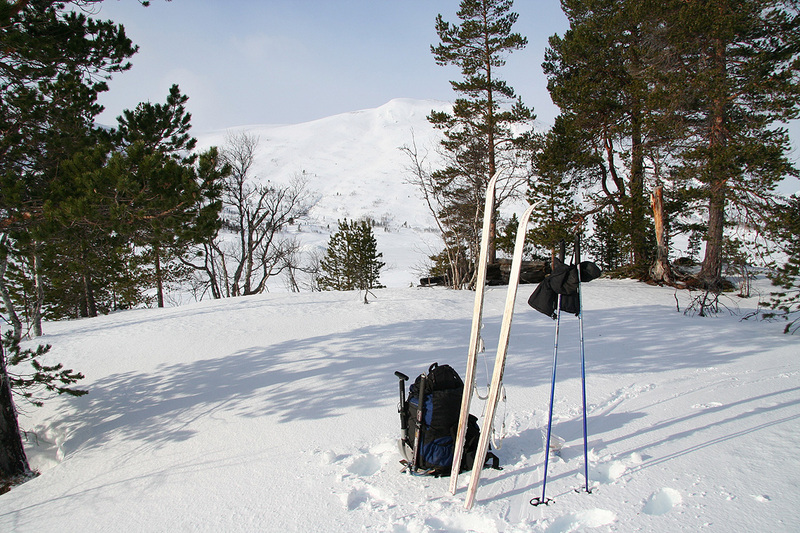 I decided to leave the skis and proceed uphill with crampons, an ice axe and a single ski pole. This decision meant about 5 kilometer of walking, clearly much more time consuming than using skis. As it often happens, as soon as I got higher, the icy crust disappeared and the snow was good for skis. Too late, my skis were barely visible a few hundred meters below. With all hindsight, it would have paid to continue skiing up this slope. The landscape and the lake below showed that I was making progress. Snota continued to capture my attention, lots of steep rock, how would a ski route up there look? The saddle was nice and broad, the final slope looked steep and had not a single rock, however, as soon as I got across to its left (east) side, things looked much better and I wished my skis had been with me. The summit was very flat and it took a while before I came to the cairn. There were more clouds, but still a pretty good panoramic view. I had walked about 1.5 hours and a good rest was called for. When leaving, I decided to traverse across the north summit on my return hike. That route looked better on foot and gave me reason to, on average, be pretty happy with this long walk without skis. I made a brief stop at the cairn, my climb had now lasted more than 6 hours and quite a bit remained before I would reach the hut. The weather gradually turned more windy and less sunny. I found my way down between some rather large rocks and returned to my skis at 1520. A fairly quick ski brought me back to the lake, almost at its southern end. My mind had this abstract idea that the hut was located at the end of the lake. This is not entirely true and when the GPS estimated a straight line distance of 3.9 kilometer, I realized that the trip was not quite over. The forest and a couple of pretty big, open rivers further complicated this last leg of my trip. I arrived at 1730, a very nice 9 hour ski trip had come to an end. It took until dark to discover a few key facts. The key to the (fire)wood storage was not located as the sign read. There was more wood outside, however an axe to make smaller pieces for starting the fire had been nice. Matches and candle lights were also running low. The food supply was not overwhelming, but would serve its purpose. I had dinner and dried some clothes before going to bed rather early. The wind kept going all night and it started to snow. I got up at 0600, looked out and went straight back to bed. Another look out at 0800 seemed slightly better. 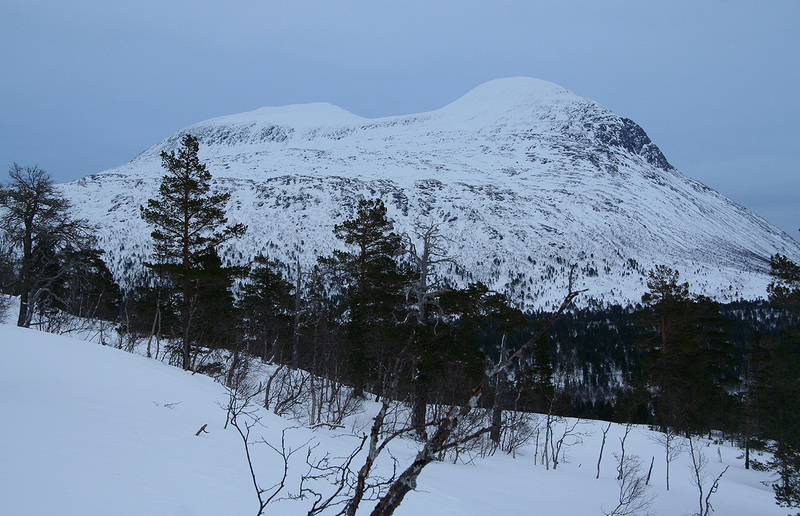 I decided to get out and head towards my second goal, the mountain Blåhøa. Trollhetta, as seen on the way from Trollheimshytta towards Snota. The summit cairn. The north summit is visible behind. (the view is east to south). 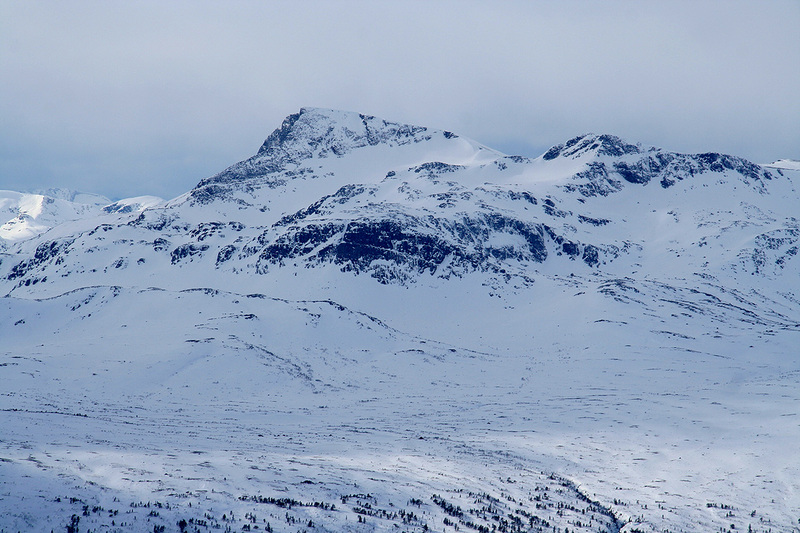 Snota, as seen from Trollhetta.